Gus La Casse is coming back to Georgetown. A tremendous folk fiddler, we’ve been lucky enough to draw Gus down to Georgetown from his Trenton lair several times. He knows how to use our stage and get folks dancing in the aisles. Described as a folk fiddler with both speed and savage energy, Gus La Casse’s repertoire reflects his innovative spirit and dedication to the Cape Breton and Acadian fiddle traditions, playing both standards of the genre and his original material. Based in Downeast Maine, Gus maintains an active performance schedule as a solo artist and with other musicians including guitarist Peter Lindquist, rock-to-world-music band Big Tree and a contra dance trio. Gus’ music has also taken him beyond Maine. 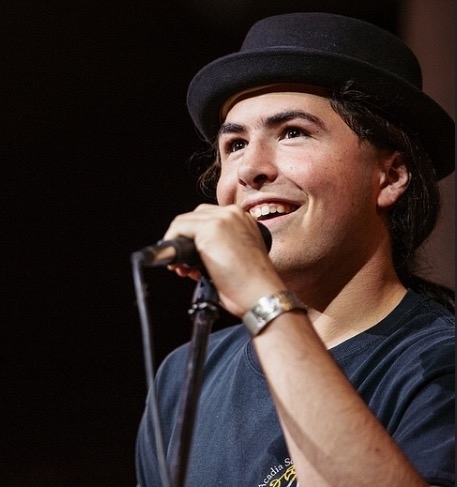 He was the 2014 student in residence at The Acadia School of Traditional Music, appearing on the Canadian international television broadcast from the Congrès Mondial Acadien 2014. He traveled to Ireland as part of the Young Tradition Vermont touring group in 2016, and has enjoyed playing the legendary Club Passim in Cambridge, MA. You can see him on stage HERE. Read more about Gus in the Bangor Daily News! Doors open at 6 PM, Concert at 7 PM. Dinner option to be announced. Tickets are $10 in advance, $15 at the door. Dinner is going to be an Acadian kitchen party classic, a rich savory chicken fricot (a chicken dumpling stew), served with salad and bread. Veggies can opt for a veggie pasta. $21 includes tax & gratuity.